There are many ways to carry enough fluids for a ride. 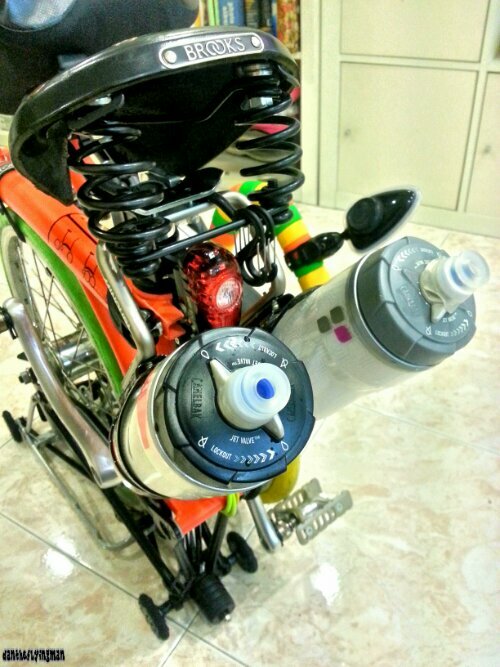 On a Brompton, there is the option to put the bottles into a Mini-O bag. 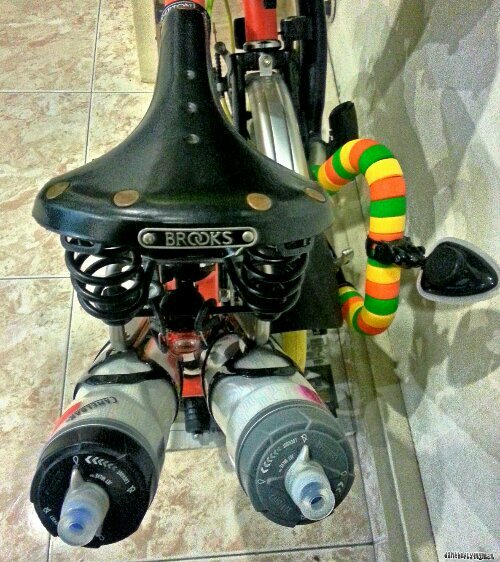 Some install the water bottle cage system on the handlebar stem to hold a water bottle. I have both options on for some months. With both the Mini-O bag and the Monkii Bottle Cage system, I am able to carry at least two water bottles. 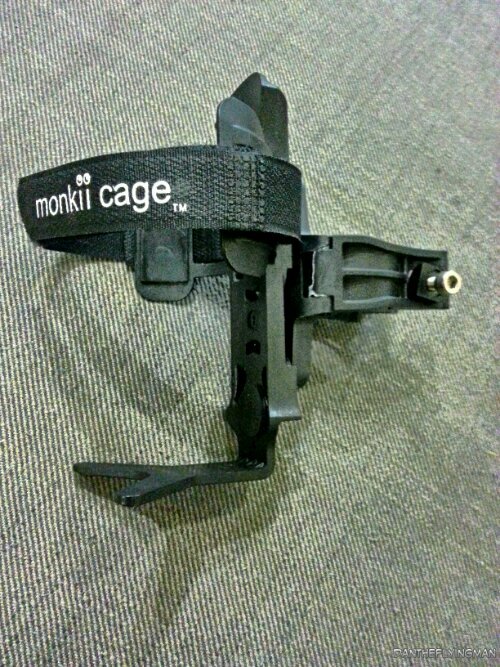 The Monkii Water Bottle Cage system. However, the weight at the front increased a lot, with two water bottles, and when folded with a water bottle on the handlebar stem, the B tends to tip to the right even easier. A couple of times, my B almost fell flat on its right side. At the same time, the handlebar stem is also very cluttered (a battery pack for the NiteRider 300+ front headlamp is also installed on the stem). (1) reduce the weight of carrying water bottles drastically. (2) allow me to carry two water bottles without carrying any bags on the front block. This is for days when I am going on a speed trip. I was searching on the web as well as Facebook groups for images on how water bottles are carried on Bromptons. Finally settled on installing a bracket that supports two bottle cages. How it looks like at the rear now, with twin water bottle cages. Even if I have to lay the B on its side in the car boot during transportation, the cages are well protected by the width of the saddle and as such, no contact with the boot floor. 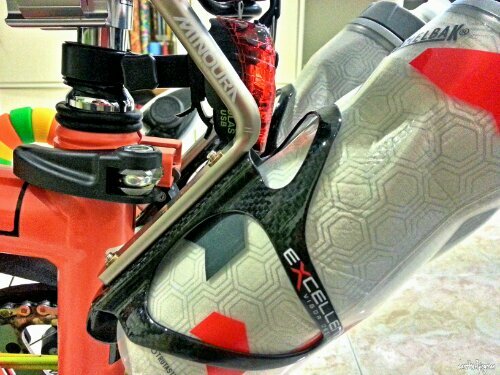 A closer look at one of the carbon fibre water bottle cages and the anionzed aluminum bracket used to hold two water bottle cages. Going to take it out for a spin the next day to test it out. Pingback: Know Your Bottled Water! | Is Drinking From a Water Bottle Left in the Car Dangerous?